This year, 2017, marks the 500th anniversary of Martin Luther’s nailing of the 95 Thesis to the door of the Wittenberg cathedral in 1517. To celebrate this, all the Protestant denominations of Spain came together in Madrid to participate in five different events during July 10-15. One of these events was the 8th Evangelical Congress. Around 500 pastors and leaders came together to reflect on trends in the Spanish church and in society. In the evening, Gary Wilkerson spoke on having the fire of God in us and motivating us. Simultaneously, about 1,000 young people from all over Spain and from many different denominations celebrated a week of “Urban Camp” with workshops and services. An outstanding part of the Urban Camp was “on-the-job training” where the young people took to the streets to witness, especially in the Metro stops. The third event, commemorating the 500th Anniversary itself, was open to evangelicals in general and not just to leaders. Taking place in the Sports Palace in Madrid, official estimates place the attendance at 8,000 people. A large outdoor evangelistic event took place on Saturday morning in the Paseo del Prado, the main north/south avenue in Madrid. Traffic was blocked off and artistic ministry and testimonies were given. Juan Carlos Escobar, President of the Spanish Assemblies of God and coordinator of the events for this 500th anniversary, preached a salvation message and gave an invitation for salvation. Finally, on Saturday evening, a macro-concert was held in the Sports Palace where-well known musicians from Spain and other countries ministered, closing the week’s events. 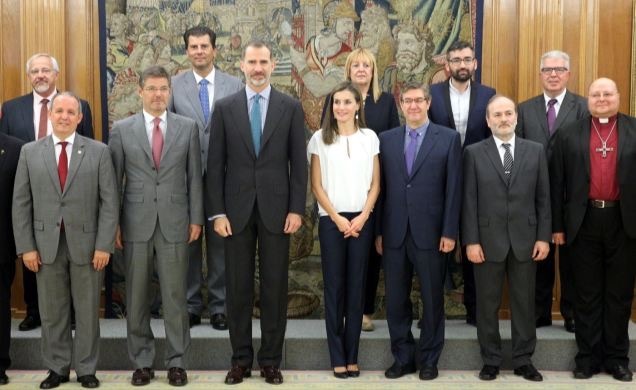 Almost two weeks later, in an exclusive audience in the Zarzuela Palace, Spain’s King Felipe VI and Queen Leticia received the organizing committee for the 500th anniversary.